Eric E. Johnson is Associate Professor of Law at the University of North Dakota School of Law. He received his B.A. from the Plan II Honors Program at the University of Texas at Austin and his J.D. from Harvard Law School. Eric practiced law in Los Angeles as an associate at Irell & Manella, LLP and as in-house counsel for Fox Cable Networks. 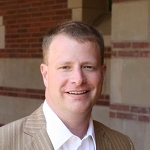 In addition to teaching at the University of North Dakota, Eric has taught at Texas Tech University School of Law as a visiting professor, at Whittier Law School and Pepperdine University School of Law as an adjunct professor, and at Harvard Law School as an instructor of Legal Reasoning and Argument. Eric archives course materials, papers, and old exams at ericejohnson.com.